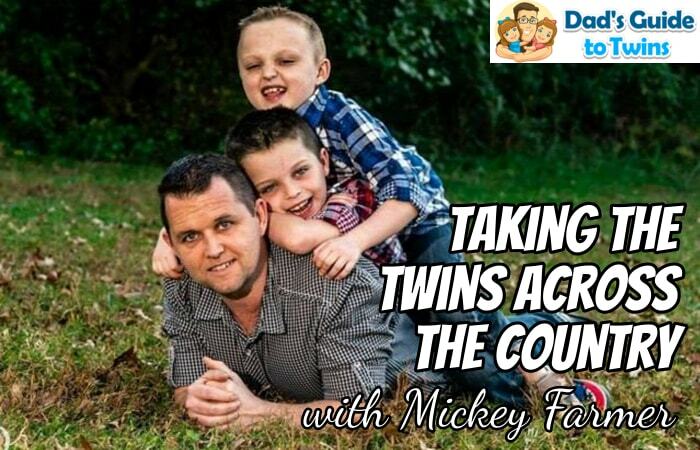 In this episode, I chat with Mickey Farmer, father of fraternal twin boys. 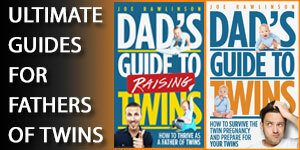 Joe: Welcome to the Dad’s Guide to Twins Podcast, the podcast that’ll help you survive and thrive as a father of twins. 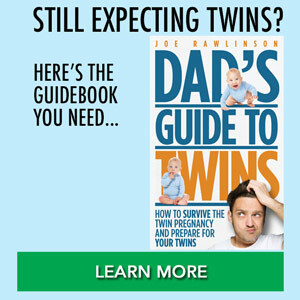 Now here’s your host, the author of the book, The Dad’s Guide to Twins, Joe Rawlinson. Joe: Today we are continuing our father of twins interview series with fellow father of twins, Mickey Farmer. Who shares his journey from the challenges they had even having twins to now they’re very healthy and robust, nine and a half year old twin boys. Today’s show is brought to you by my twintshirtcompany.com. 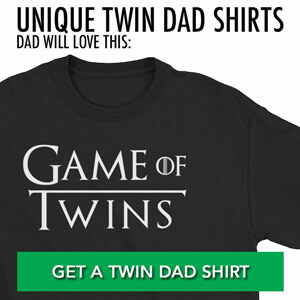 Where you’ll find dozens of T-shirts designed specifically for you parents of twins, dads of twins, moms of twins, grandparents of twins, and the twins themselves. 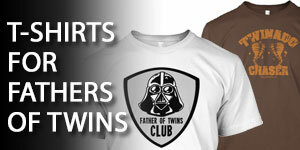 Check out those shirts at twintshirtcompany.com. Let’s jump right into the interview with Mickey. Today I’d like to welcome to this show, fellow father of twins, Mickey Farmer. Welcome to the show. Mickey: Thank you Joe. Thanks for having me. Joe: Yeah, you bet. So Mickey, tell us a little bit about your family right now. How old are your twins and what’s kind of the most exciting part of this age? Mickey: I have nine and a half year old twin boys, fraternal not identical. And every age so far has held a different type of excitement. I wouldn’t say different level but different type. At the moment we’re just, it’s like I’ve got my little buddies no matter what we do, we do it together. We’re all heavily involved in scouts and we do soccer and I’m their soccer coach too when we do it. But our town soccer kind of imploded this past season. So, in lieu of that we are … I have kind of a home gym in our basement. We’ve been doing that together just to keep us active and that’s … it’s not out running on the field with a whole team full of other people. But it’s kind of provided a different level of daddy’s son bonding time. We go downstairs and turn on cartoons and workout with them. Joe: That’s great. Way to be creative when some activity we count on kind of disappears. You stepped up and found something that would work for your kids. That’s awesome. My girls are maybe just about a year ahead of your boys, so around the same age. Let’s rewind the clock a little bit. What was your family situation like when you found out that you would be having twins? Mickey: My wife and I were having trouble having kids. That’s which is why we have twins. We did the whole in vitro route and so we call them our bogo babies. We bought one, got one. They put two in, they both took so we’ve got two for the price of one, which was good because it was an expensive one. This was at this … I had a doctor with a sense of humor and I have a bit of sense of humor. So, we had bonded in that way and so when we found out what we were having and how many we’re having, it was at the same time that the Octomom was in the news. And he toyed with me for a while before revealing it was just two. Probably one of the only twin parents relieved that it was twins. Joe: Once you were expecting, how did the pregnancy go from there? Mickey: Actually very well. My wife is a social worker at a hospital, so she … his friends were the nurses and they were checking her blood pressure every day. So, it was like having a free doctor visit every day. So, she worked until the day before they were born. she was … huge isn’t a big enough word. Literally she was enormous. You’re a twin dads so you know right up at that date, elbows and knees are poking through. It’s like a scene out of alien they pop out any moment. On the day before they were born, one of the nurses checked her blood pressure and it has skyrocketed. So, she went to the doctor, I met her there and they put her on bed rest for the rest of the pregnancy. Now that ended up being less than 24 hours. Joe: How far along was she at this point? Mickey: She was 35 weeks. 35 weeks early. She went … I drove her home, we left her car. So, the next day my mother-in-law and I went to get her car and we left friends and the family here with her. And while we were at the hospital picking up the car, the friends called and said, “Just stay there. We’re on our way.” It was great. They were cesarean. Only one had to go to the NICU. And really that was only as a precaution. Because they said, “Anytime you have cesarean with twins, the second one always breathed in a little bit of amniotic fluid.” So, they put him in there just for a few hours and only as like I said, as a precaution just to make sure he was breathing okay and he was. My wife was obviously in the hospital bed so she couldn’t go. So, I was the only one that went to the NICU to sit with him. Can’t tell you, can’t stress enough how thankful I was and how lucky I felt that comparatively speaking, he was doing so well because not everybody in the NICU is that lucky. Joe: So, if we rewind back to your friends were with your wife at home. So, did her water break or does she just started going into labor? How do they know it’s time to go to the hospital? Mickey: This was when Wipeout was a big TV show and she was watching Wipeout and roughly the time that somebody bounced off one of those balls and landed in the water, her water broke. And the friends were driving just a regular pickup truck. So, they had to come to the hospital three deep in a pickup truck. And he had … is actually a puppy of my dog, but it was no longer puppy. It was like a hundred pound yellow lab and a Kennel on the back of the pickup truck. So, in my mind it looked like the Clampetts from Beverly Hillbillies. Joe: So, when she got to the hospital, you said that your boys are born via C-section. Was that expected or was that a surprise? Mickey: It was expected. They had talked about possibly having natural childbirth but one of them was kind of up to the right in a position that wasn’t the best. So, they thought it would … to get him out more quickly, to do the C-section would be the safest option. Mickey: how far along were yours. Joe: They were 36 weeks. Yeah. So, about the same time as yours. So, they had long enough time to cook in the oven. So, they came out pretty good. We didn’t have to stay longer with him at the hospital. Mickey: That was the coolest thing. We were only there for three days. When they came out, one was four pounds 11 ounces, one was four pounds five ounces. And those first few days they lose a little bit of weight. So, when they came home on day three and there’s a special thing about day three. But when they came home on day three, four 11 had gone down to four six and four five had gone down to three 15. So, the smaller one came home at three pounds 15 ounces. We took pictures of them on either side of a 20 ounce soda bottle. That now it’s such a cool picture because it looks like babies beside a two liter. And it is not that it’s a 20 ounce. But the coolest thing about it was that day three, June 18th, 2009 was father’s Day. Mickey: Best father’s day gift ever. Joe: So, what were some of the challenges in those early days with your boys? Mickey: And it sounds like you didn’t have this. So, honestly I think your scenario would be more challenging. We didn’t have any singletons before our twins. So, we didn’t know what to compare to. 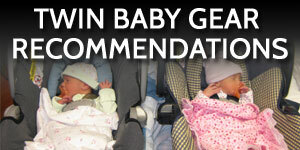 So, I think in my mind, if you have one and then have twins, you know how much simpler one is. So, you know how I want to say how bad, but how difficult you have it. We didn’t have anything to compare to. So, we saw it as normal. We weren’t getting a lot of sleep. I had one, she had the other. We would switch so we get to bond with both. Really it wasn’t that bad. Joe: How much time were you able to take off of work? Mickey: She took, I want to say six weeks and I took less than a week. I stayed out long enough, whatever the recommended time was since she had major surgery, she couldn’t even lift the babies. I don’t remember how much time that was, but it wasn’t much more than a week. Dove Men+Care is pushing for paternity leave and father rights basically. The job I had did not have that. I was … the babies had just literally just come out and I got a call, “When you coming back?” So, I stayed out as long as I could, but it was … and as long as I had to specifically for my wife for the operation, but beyond that I had to get back. Joe: Yes. That’s such a tough situation when you want nothing more than to be with your family. You want to help your wife, like you said, just had major surgery. She’s recovering from her C-section and to help those little boys and bond with them. And then the first thing you turn around and have to get be back at the job. Mickey: The other hardest part was childcare. Finding childcare for two babies was like another mortgage. But we got very lucky. We found an in home daycare of a lady who the whole town knows her. She’s watched kids for generations and never had a complaint. So, we went to her and she became like a bonus grandma. Joe: So, as soon as your wife went back to work, the boys went off to this daycare? Joe: And then because they’re so infants, you’re up with them at night I suppose? Did you both wake up to help feed or did you take turns? How did that work? Mickey: We took turns. But we didn’t take entire night turns. Like Monday night was my night and Tuesday nights her night. It was the first baby wakes up, it’s my turn. The second baby wakes up, it’s her turn. And they never slept at the same time. Somehow their sleep schedule never synced up. Joe: That’s extra rough. Because it seems like you’re always then feeding somebody, changing somebody. Mickey: Yes. And we were, I mean that was … a bit again, we didn’t have any compare to. So, it was our normal but we were very tired. Joe: So, when did things start to get easier? Mickey: So, I’m sure there’s advantages and disadvantages to that. But the advantage for us was once they were able to start playing independently of us, they had each other and play time could go for over an hour drawing, specifically drawing. They were in the art at a very early age. One of them can just sit up there and draw for two hours without making a peep and the other one would stay with him for most of it. Joe: Do they still have very similar interests or those starting to differ now as I get older? Mickey: Yeah. Excellent. Good word. Because that is [inaudible 00:14:08] or back to the future. So, I felt I have done my job. Joe: You’ve trained them well from an early age. That’s awesome. So, are they been in the same classes at school or they’ve been separate? Mickey: I was keeping them in the same class. So, kindergarten through or preschool through third grade they were in the same class. But last year the level of bickering seemed to increase. So, my wife pushed for them to be in separate classes and I tell no for sure that that really helped or decreased the amount of bickering. But I’m sure it’s helped in their independence. Because one tended to help the other one instead of letting the other one stand on his own sometimes. But now the teachers have told me at the end of the day, and that they’ve noticed this almost every day. At the end of the day when it comes time to go home, they’ll go to the door of their classroom and look across the hall for the other one. And their eyes light up. They’re excited. So, I think it’s been a good thing. Mickey: I will say that I talk to teachers, we’ll call that I did research. But it was suggested to me to keep them together unless there was personality issue, keep them together because to keep the same homework. And I have noticed that this year, even though they generally have the same homework, they might not have at the same week. So, as the parent reviewing the homework and helping them out with their homework it makes it a little more difficult for the parent. Because you’re kind of doing double duty now instead of the same thing twice. And the teachers did tell me as they get older, so since yours are 10 as they get older, the way it works around here is you get put in … I think they’re called teams. So, one kid might have Ms. … you had the same three teachers and they just generally different rotation level. So, one kid might have Ms. Smith in the morning and the other kid had Ms. Smith in the afternoon, but you want them on the same team so that they end up with the same homework. Joe: Yeah, those are great points. I think the logistics of helping your kids through their academics like that, helping with homework and managing the relationships with the teachers and communication, it is a lot easier when they’re in the same class or on the same team like you’re describing. We’ve had our kids, our girls in both situations where they’ve been in separate classes and then together. And there are of course pros and cons to both of them. But yeah, when they were in separate classes, keeping up with the different communication from the different teachers and homework that would just drive my wife and I crazy because it’d be so close to the same thing but totally different. Mickey: What did you do when your class has, say a Christmas party and you can’t be in both classes at the same time? Joe: Sometimes we would like go for half of the party with one girl and the other half with the other girl. Yeah. I mean you can only do so much when they have to be in two places at the same time. Mickey: I don’t think it’s twins but the TV show, This Is Us. The very first episode, something I’ll remember forever. It was such a cool scene. The married couple one was … they were at their kid’s soccer games but they were on two different teams. So, the wife was watching one kid play, the husband was watching the other kid play and then at a certain time, maybe half time they just turned. And then they watched the opposite kid that they had been watching. Joe: It’s simple but effective, right? Joe: This year we’ve had our girls together. The last couple of years they were separate. And you had mentioned one twin may be a little more dependent on the other twin and we’ve definitely seen that as they’ve been together. One will lean more on the other for help and understanding what’s being taught or the homework and stuff. And so, next year they’re off to middle school and they’ll be in different classes because they’ll have different electives and all that stuff. So, that’ll be interesting to see how that plays out for them. Joe: Right Mickey, you’ve written a great book, The Family 50: Roadtripping the United States. And so, I want to talk a little bit about travel with twins, with family and maybe some of the travel hacks you’ve learned along the way. First of all, what was the impetus behind writing this book in the first place? Mickey: I’ve always had a goal of seeing all 50 States in seven continents. Talking about the States specifically. It’s always been part of the goal is to not just mark a State off the map because I drove through it or because I had a layover or a night hotel stay. I want to do something specific to each State. And moreover, if your State has a zoo, where I am I have a zoo. So, I don’t … unless it’s a special zoo like San Diego Zoo, then that’s probably not going to make my list. You have a museum, sure. Unless it’s the Guggenheim or the Chicago Art Institute, then I’ll just go to … I live next to Charlotte, so Charlotte has museums. So, it has to be something specific or something special to that area. Mickey: I’ll give you another example. When we went to like the Great Lake States, I was researching those and most of Wisconsin and Minnesota was go there for camping, go there for canoeing or that sort of thing. Now that I’ve been, I do want to go back to Minnesota to the boundary waters because I do want to do the canoeing there. But at the time I thought, well I can do all that in North Carolina. I want to do something that I can’t do here. So, we chose … and my wife is usually a really good sport about kind of just going along for the ride. We chose to go to Minnesota in zero degree winter. But by doing so, we got to go dog sledding, snowmobiling. In Wisconsin we’ve got to walk out on Lake Superior because it had completely frozen over and you can … at the Apostle Islands, you can walk to the sea caves in that time become the ice caves so you can walk to those. So, we have to do a whole lot of things that would be impossible to do any of that around here. Joe: Yeah, that’s for sure. I like that philosophy of doing something unique everywhere you go. Are there definitely [inaudible 00:20:49] those memories too? What have been some of the things that have helped traveling as a family to so many different places? How your boys naturally get travelers or if you had some systems to help make that go a little more smoothly? Mickey: They’ve been to 40 states or they’ve been to 37. This summer they will have been to 40. Now, all of those States they won’t remember. But that was another aspect of my planning with them involved is I wanted to go as when they were younger, that the trips that they won’t remember, I wanted to be things that they could drive to. Or it might take a determined drive because we did drive from North Carolina to your area, Texas at one point. So, it might take a determined drive something they could drive to. As they get older, we’ve been going further out, even requiring flying at times. So, that was one thing that I did. Mickey: There were some shorter trips when they were younger to kind of get them used to traveling but also games systems. When they were little we had LeapPads. And now that they’re older, they have 3DSs. So, there’s two years ago we drove from here to Yellowstone and we’re driving through some part of Yellowstone now. They had already been in Yellowstone a couple of days, so I guess they were bored with nature. But they were on the 3DSs and I’m saying, “Hey guys, look out the window there’s … look at all the scenery.” And one of them just looks up and it’s a family joke now. He just looks up and he says, “Green.” And then he goes right back to the 3DS. Joe: That’s I laugh because we’ve had this very similar experiences where they’re on their devices. They were like, “Oh, we’re just enjoying this amazing ride through wherever we are.” And they’re just like, “Ah ah,” kind of like zombies. Mickey: The night before the trip I’ll go to sleep early. The kids and the wife can stay up as late as they want, say 2:00 AM, 3:00 AM. I already had the car packed and all they have to do is get up, get to the car and go back to sleep and I start driving. So, 2:00 AM, 3:00 AM to … they don’t wake up till nine, well you’re already over halfway there to nearly anywhere this side of the country. So, that cuts their car time in half if not more. Joe: If everybody dilly dally is in the morning getting in the car. Mickey: I have a whole lot of travel books. Thousand things to see before … Thousand places to visit before you die. I’ve got some that are really cool geared towards kids. A 101 things you got to do … that’s how it said, 101 Things you got to do Before You Grow Up, things like that. And then there’s always Google. So, I’ll Google top things to do in a State or a specific city. You’re in Austin, right? Mickey: So, I Google top things to do in Austin and I get the best well under the bridge, things like that. So, I keep just running list of things in a OneNote, Microsoft OneNote. And then as I talk to people that have visited a certain area or lived in a certain area, I’ll ask them advice and if they say something that’s not on my list, I add it to the list. Because the worst thing is to go somewhere and get back. And I’ve had this happen. You go somewhere, you think you’ve experienced the place, you get back and somebody says, “Oh, that’s great. Did you do X?” And then you didn’t. And you feel like, wow, that would have been such a great thing to do. Mickey: The one I’m thinking of is we went to the Florida Keys and apparently in Key West I think is on Friday nights they have, it sounds like a little mini carnival each Friday. People, jugglers and flame eaters and all kinds of stuff, fortune tellers. Everybody comes out to this dock area and there’s a party every Friday. So, the sunset party, I think it’s called. And I get back not having done that. We do everything else here and it was a beautiful place. It’s one of the places I would be willing to revisit any time. But I get back and my boss says, “Oh, did you do the sunset celebration?” That’s what it’s called. And I said, “What is that?” And he describes it and it sounds like this magical thing that I really wish I’d done, but I missed it. So, I do research to avoid that. Joe: Yeah, those are some good research tips. I know we’ve had the same thing happen and when it comes up you’re like, “Okay, well let’s just, all the more reason to go back and experience it one more time. There’s always something else that you can see or experience, even seeing some place that you’ve been before.” So, if listeners want to check out your book, where’s the best place to find it? Mickey: It’s on Amazon. And that’s what it is. It is the culmination of all of that research. And it has, like I said, those specific things to do per se. And zoos, if you’re the San Diego Zoo, the Bronx Zoo, that’s included. If you’re the Guggenheim or the natural history museum which is where the ninth museum was set, those things are included. So, it’s not just the odd things. And actually specifically if you consider each State a chapter at the end of each chapter, there’s two recurring features I guess you’d call them. One is festivals, the yearly festivals of the State. Some of those can be quite interesting too. Like Colorado has dead guy days where apparently some Norwegian guy has himself cryogenically frozen in the town. And so, every year they celebrate that and they have coffin races down main street. Mickey: So, there’s the festival section and then there’s also a section that I titled Haunted, unique or just playing weird. So, not the zoo’s, not the national parks, not the normal stuff that a State offers. If it’s super weird or haunted, it goes on that section per State. So, then you get things like Idaho has the world’s biggest dog. It’s a Beagle and it’s a bed and breakfast and it is ran by an artist, two artists that designed and built it and are two of the nicest people. They’ll talk your head off and you’ll love every minute. They’re so nice. Joe: There’s unique stuff around every corner. So, that’s great. I’ll all link up to the book in the show notes for this podcast episode. Now Mickey, you also a good writer. You shared lots of, not just travel tips but experiences with your family. Where can listeners connect with you and see some of your writing? Mickey: Griswolddad.wixsite.com/parenting-and-travel. I know this long, but I chose griswolddad because I want to write about parenting and travel. So, the only way I could imagine putting those together was the classic Chevy Chase character. That’s what he did. He was a good dad and he traveled. So, griswolddad is the name of my site. I do a lot of, like you said, parenting stories, travel stories, travel tips and advice, parenting tips and advice. Joe: So, if listeners want to connect with you, what’s the best way to reach out? Mickey: Griswolddad on Facebook, all one word. Griswolddad on Twitter. And on Instagram it’s griswolddad_site. Joe: Well I’ll link all these in the show notes as well so listeners can connect with you and read some of your stuff and your book. Again, thank you so much for sharing your twin journey with us today. Mickey, we really appreciate it. Mickey: Thank you sir. I appreciate it. 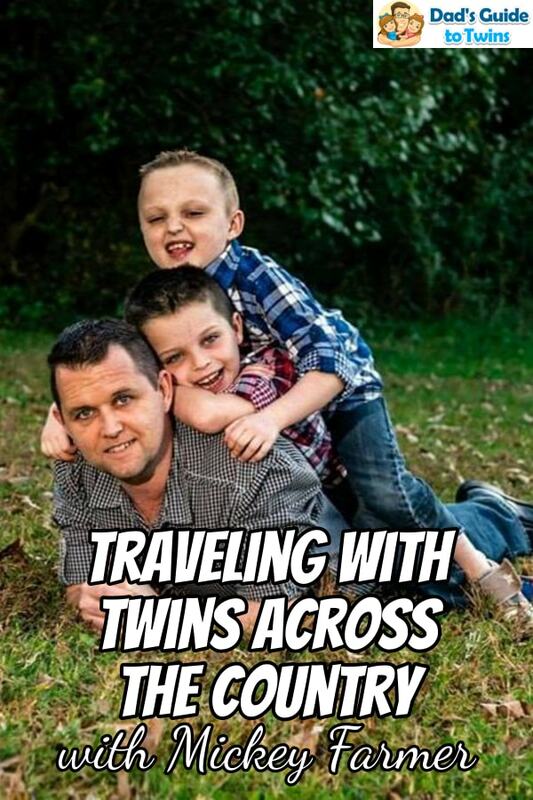 Joe: I hope you enjoyed that chat with Mickey Farmer about his twin journey so far with his fraternal twin boys plus a lot of interesting travel tips about how to travel with the family and create some great memories along the way. 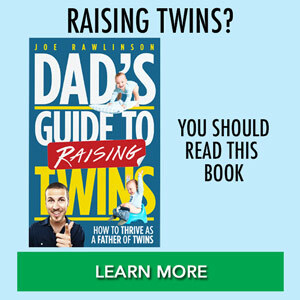 Again, I’ll link up to all of his resources in the show notes over at twindadpodcast.com. 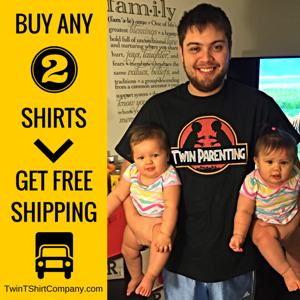 As a reminder, today’s show is brought to you by twintshirtcompany.com where you’ll find dozens of T-shirts designed specifically for us: parents of twins. Check out the shirts at twintshirtcompany.com. Thank you so much for listening and I’ll see you next time.